It is round, smooth and, in comparison with the rest of the body, small. The eyes are dark for white pigeons and orange for all the other colors/patterns. The skin around the eye is thin and corresponds with the feather color. It is of moderate length and strength. 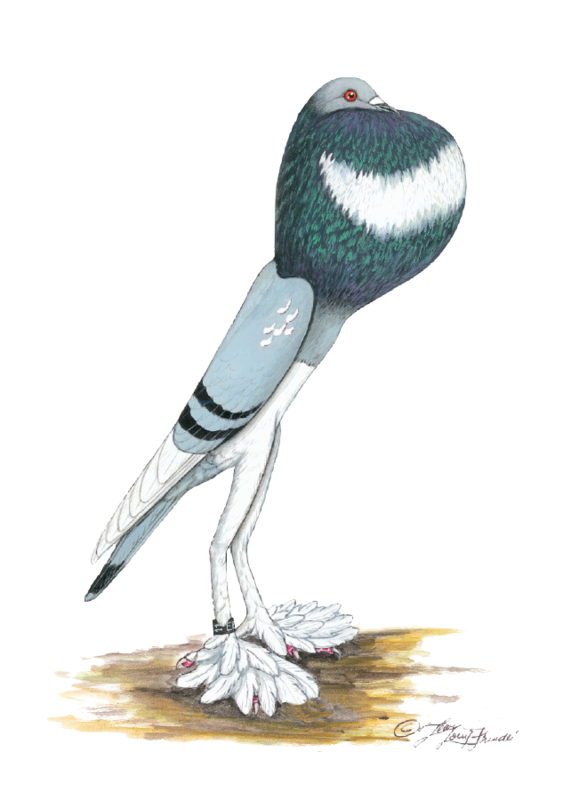 The beak color is light for white, black for black, dark for blue pigeons and tan for pigeons of all the other colors. It should be long with a spherical crop gradually narrowing towards the end and settling well, forming a gentle bow from the back of the head to the shoulders. The area between the neck and legs has to be long with a well defined breast bone. Long, sloped (in line with the tail) from the shoulders and narrowing towards the tail. They have to be long, not too wide, closed narrowly towards the end, smoothly resting on the tail without crossing each other. Narrow and straight, must not touch the ground. Front: Long and compact, straight up to the heels, slim legs, heels slightly facing inwards and backwards without touching each other. Sideways: The lower legs are bent slightly forward without looking like "frog legs". The waist and legs are covered with small white feathers. They must cling tightly to the skin and in this area there cannot be feathers of any other color. The leg must be feathered so that the feather form a fan shape, but the feathers must be moderately long and there should not be too many of them. They have to be strong, thin and cling elegantly to the skin. 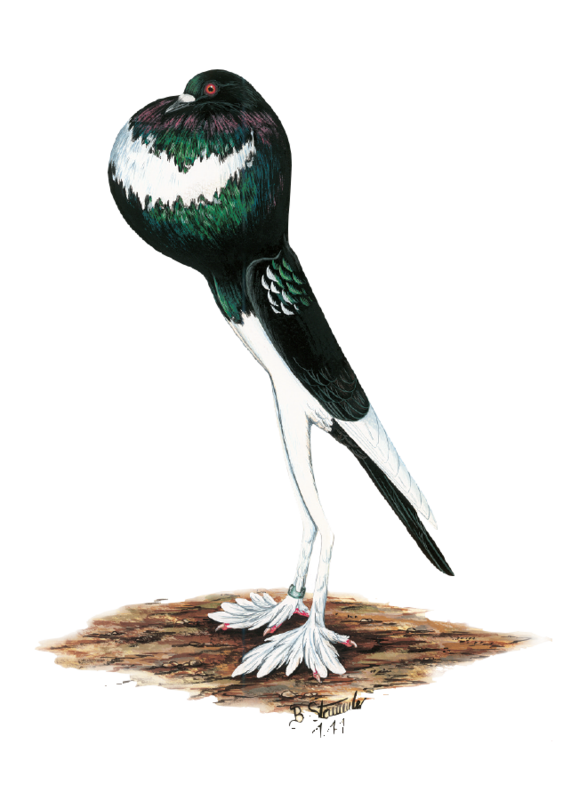 They were first bred in England during the 17th century by combining specimens of the Dutch Cropper, Scandaroon and Roman Pigeon that possessed desired traits. It is speculated that they were created through selective breeding of the Prague Pouters and smaller females of the English Pouter in the middle of the 19th century.